As Kelowna Luxury Real Estate specialists, the team at Jane Hoffman Group have in-depth knowledge of today’s current trends in the luxury real estate market. Today we’re examining the current trends. Many 50 to 70 year old buyers are looking to right-size, rather than downsize. Today this group is looking at smaller homes, perhaps with the master bedroom on the main floor. They are after a home with enough indoor and outdoor space for entertaining, and to provide space for when family and friends come to visit. The consideration of condos and townhomes is also at play, in communities and buildings with amenities. The younger buyers are seeking lifestyle options as they balance work, home and play. They trend toward modern/contemporary spaces that lend themselves to creativity, efficiency and comfort. These buyers are moving their families to areas like Kelowna and the Okanagan where the lifestyle plays an important role. The work-life-balance seekers wish for spectacular views, proximity to the lake (if not waterfront), pools, large outdoor spaces for entertaining and work spaces within the home. Outdoor living used to be the space around the pool, then it became a better space to grill and eat. Now, in many homes, we are seeing the trend toward full outdoor living, dining rooms and kitchens. Additionally, many buyers are looking for homes where the line between indoors and outdoors is indistinguishable. Porcelain floors and glass walls are the latest trends in luxury materials. We’re also seeing a return to matte finishes, coppers and stainless steel. Buyers are looking for clean lines and soothing color palettes. While white is on trend, texture adds balance and warmth and still remains popular. Today’s modern farmhouse and coastal contemporary styles both utilize mixed materials to find the right blend of clean lines and warmth. Kelowna, BC is known as an International wine region and our luxury home buyers seek stunning spaces to store and showcase their wine collection. From wine coolers and storage spaces in the kitchen and butler’s pantry to vineyard-inspired wine cellars, wine spaces are an important wish-list item for our buyers. Many buyers are still looking for large his and her closets. Of course, when it comes to the closet for the women, they want the biggest closet the space can allow, with ample storage and organizational options for everything from their casual wear to their evening wear, to their shoes and their handbags. Buyers are always looking for closet spaces to be functional, well-lit, and spacious. His and her work spaces are becoming more popular, even among our retirees who are highly engaged in non-profit work, community organizations or even assisting with the grandchildren’s schedules. With a focus on lifestyle, telecommuting, and entrepreneurship we are seeing many couples who would like separate, private spaces for their home office. If the home office can have a beautiful view, it’s even more appealing. If you are looking for a dream home in Kelowna, our team at Jane Hoffman Group is happy to discuss with you the current trends in today’s market. We can work together to determine the luxury home features most important to you to find the right property for you to call home. 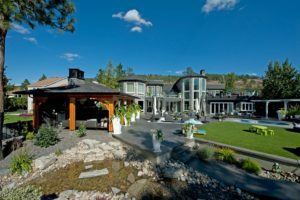 The following is a sampling of the Kelowna luxury real estate listings in our portfolio. Soaring ceilings with walls of glass showcase the lake and mountain views. Open concept living, dining and kitchen take full advantage of the lakeside setting. Offering nearly 9000 square feet of luxury living. This home features current luxury trends including 5 bdrms, 7 bathrooms, 5 fireplaces, geothermal heating/cooling system plus infloor heating throughout. Castle rock & Hardie board siding, Douglas fir timbers throughout with an impressive porte-cochere to welcome guests.